We will then move on to more advanced learning that will revolve around the strategy and execution of specific assignments that can be applicable to your job or business, the tools to use, and overall approach to creating professional work. The goal of this article is to help answer questions that everyone has while getting started as well as clarify information that is key to understand prior to starting any projects. As a young professional in the digital age, it is important to have multiple skill sets across many disciplines in order to stand out. Often times, creative development is the missing link that requires outside help. You’d be amazed with how effective you can be with a very basic understanding of Adobe software. Photoshop (in many designers’ opinions) is the best place to start before moving on to Adobe’s other applications. Tip: Develop a plan of recurring projects to practice what you learn. No matter how many tutorials watch, actually applying this knowledge is where you will learn the most. Retouching Photos – There is no better tool than Photoshop to retouch photos. This is the place to go to color correct, digitally enhance, or even remove certain sections of an image. Photoshop’s adjustment tools and layers are very flexible. Editing Artwork – Whether it’s for digital or print, Photoshop has thousands of features that will allow you to design and edit photos, drawings, paintings, artwork, or anything else in ways that no other adobe program are capable of. Digital Images for the Web – Social media imager and ads, banner ads, email headers, videos, etc. Using Photoshop will ensure that everything you create will be the right size, dimensions, and optimized for digital use. Website Mockups – The layers feature of Photoshop make it easy to design and organize your mockups. Plus, since it is a pixel-based program everything is already designed to the correct size and proportional to your website. There is no doubt that Illustrator and InDesign have their specialties, but you can technically accomplish more using Photoshop that you wouldn’t necessarily be able to get away with in Illustrator or inDesign. Layers are the foundation of Photoshop. The concept behind layers is to create the freedom to edit, move, hide, delete and arrange each object (layer) individually (or together) without affecting other layers. Having a thorough understanding of how to work with your layers in every project is considered one of the most important places to start before mastering the toolbar, adjustment layers, etc. You will prevent a lot of confusion and frustration the sooner you become comfortable in this panel. We suggest developing a habit of keeping your layers organized, grouped, and labeled as it will allow you to work a lot more efficiently. Tip: Using the Move Tool (V), right-click on an object or element of your project to reveal and select a specific layer. This comes in handy when you work on projects with a high quantity of layers. Watch this tutorial from the Adobe CC team on Layers. Located on the left side of your workspace, your toolbar is what allows you to complete just about any project you’re working on. Similar tools are grouped together, but only one icon is showing. Click and hold down on the icon to display all the tools in the group. Each tool has a keyboard shortcut associated with it (letter on the right of the tool’s name). Keyboard shortcuts are your best friend. If you have ever watched an experienced designer work in Adobe, you will notice how fast and efficient they work using their keyboard to switch between tools and perform commands. The sooner you learn these, your productivity and efficiency within the program will increase tenfold. 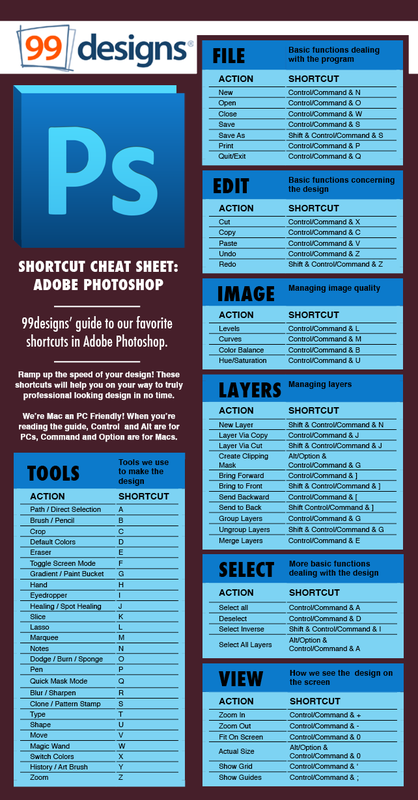 Tip: Download, print, and study this guide as a helpful resource. Tip: Hold shift when using the transform command to resize objects proportionally or draw/erase/move in straight lines. Free Tutorials: YouTube – Anything you want to learn, there are hundreds of tutorials for FREE. YouTube is hands down the most useful resource to learn (other than this blog series) how to execute just about anything in the platform. Check back for any updates, added information, or resources that we feel would be a helpful addition to this post. Adobe Creative Suite is a very complex software with endless amounts of possibilities. We want to make sure that we cover as much as possible and provide you, the reader, with as much helpful information to kick off your training. Stay tuned for the next installment of this series in which we will cover more preliminary information while getting started on tips and tricks revolving around the execution of projects that will help you at your job and/or your business.